Two recent journalism graduates from City, University of London have won a Royal Television Society prize for a film they made during their studies. 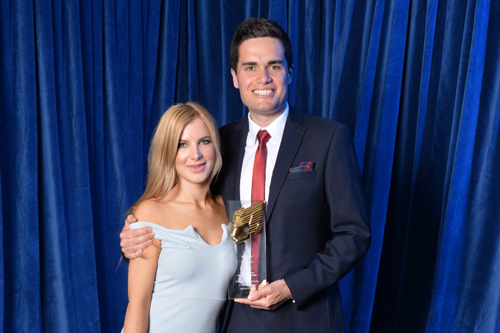 Kit Bradshaw and Rosalind Church were presented with the Postgraduate News trophy at the RTS Student Television Awards 2017. The pair, who completed the MA Broadcast Journalism course in 2016, were recognised for their project, The Naked Truth: Britain's Cyber Sperm Donors. Kit now works at Sky News and said on Twitter that he was "thrilled" to have won, while broadcast journalist Rosalind tweeted "We did it!... So so happy". The success comes after the graduates' project won BJTC Awards in 2016 for the best TV documentary and best original story. Chaired by Philip Edgar-Jones, Director of Sky Arts, the awards recognised the best audiovisual work created by students across the UK and Republic of Ireland at undergraduate and postgraduate level. The winners were announced at a ceremony, hosted by comedian, writer, presenter and actress, Katherine Ryan, on Friday 16th June at the BFI Southbank.